TO WHERE IT ALL BEGAN! Every day, year after year, we are inspired by the young men and women who walk through our doors. The promise and the potential we see in them call us all to make Newark Catholic High School the best it can be. Your $24 gift will help make all of this possible. Please help us reach our goal of $24,000 with your generous donation, anytime on or before October 24. 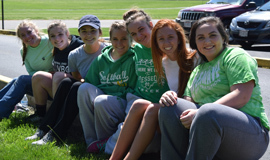 The beloved Dominican Sisters and founders of Newark Catholic High School understood that our gifts from God are to be shared, which is why charitable works have always played an essential role in student life.